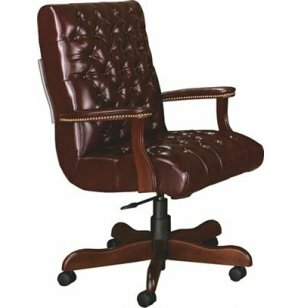 Born from a tradition of fine office furniture at affordable prices, the heirloom-quality Bedford Scoop Office Chair is classically designed to project your good taste, stability, and success at an outstanding value. Now you can bring traditional elegance into your contemporary workspace with a conference chair that is equally at home in a tech firm or school principal’s office. A tufted seat and back and brass nailhead trim highlight the beauty of an incredible selection of fabrics. 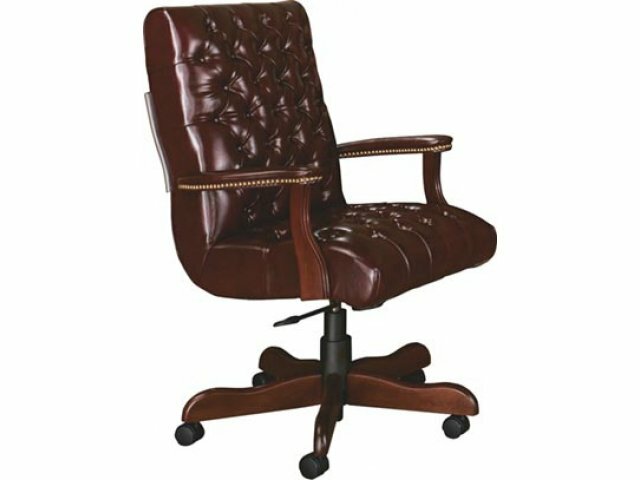 The classy design of this office chair includes all of the modern elements you need to sit comfortably throughout the workday. A swivel tilt mechanism and adjustable height promote healthy positioning, while a five-star base with dual-wheel casters lets you glide into position and get to work. Comfortable Seat: A tufted seat and back provide comfy padding for great support throughout the workday. Stately Detailing: Brass nailhead trim creates a finishing touch that sets your space apart. Personalized Positioning: A standard swivel tilt and pneumatic seat-height adjustment let you find your ideal position. Sturdy Support: Supported by a five-prong steel base with hardwood caps. Smooth Rolling: Dual-wheel casters make it easy to move around and get your chair positioned properly.